Contrary to popular belief pink peppercorns are not related to the black peppercorn (piper nigrum) in anyway. 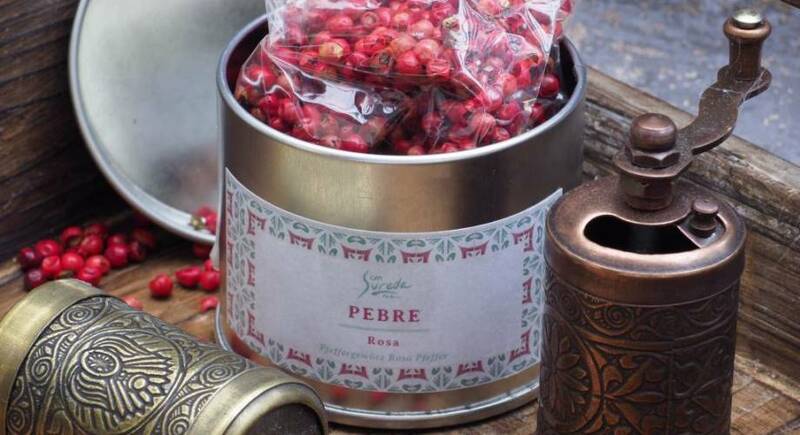 Pink peppercorns come from the Peruvian peppertree (Schinus molle) and are known as baie rose in French. They got their name because they look similar to black peppercorns and they do have a peppery taste with some sweetness and also have a somewhat fragrant perfume scent. Pink peppercorns are part of the cashew family so people with an allergy to tree nuts may need to avoid them, and generally don’t go overboard with them as they can be toxic in large quantities. They are delicate and can be crushed with a knife rather than needing to use a pepper mill. They have a delicate taste and go well with fish, pork and are a substitute for black pepper in sauces. They can be used in a Thai curry or stir fry. Try them as a garnish for soup, in ice cream, or instead of capers in a sauce or salad, nibble them with your cheese and crackers. Pink peppercorns are available on the spice rack in most large supermarkets or online.